So I'm limited to getting food from only Walmart because it's the cheapest way to go, but I really want to make sure my pets are getting the right nutrition requirements in their diet. I have a dwarf hamster hybrid and a mouse (she's sick and I might not have her much longer). I've gotten several brands, and I feel that my homemade mix along with Wild Harvest pelleted food is the best way to go for now until I find more options. I want to try all the foods I can to make sure I find the best! WildHarvest Hamster & Gerbil I've tried the mouse & rat version of this, found it to be a bit fatty and it had lots of corn. For whatever reason Walmart's website never fully loads for me. 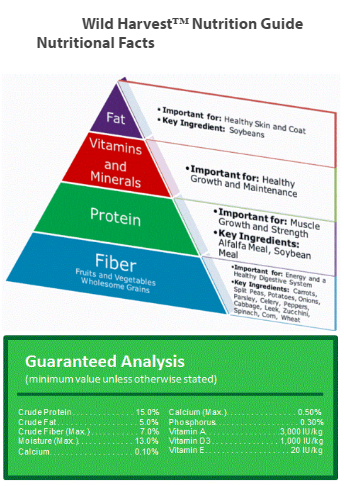 Can you share the ingredients and guaranteed analysis for each of these foods please? Crude protein (minimum) - 12.5%. Crude fat (minimum) - 5.5%. Crude fiber (maximum) - 11%. Ingredients: Wheat Middlings, Whole Wheat, Whole Com, Ground Corn, Dehydrated Alfalfa Meal, Red Milo, Cracked Corn, White Millet, Green Split Peas, Oat Groats, Black Oil Sunflower Seeds, Pumpkin Seeds, Soybean Hulls, Soy Flour, Striped Sunflower Seeds, Shelled Peanuts, Toasted Corn Flakes, Soybean Oil, Roasted Soybeans, Dehulled Soybean Meal, Dried Bananas, Corn Gluten Meal, Rolled Oats, Raisins, Calcium Carbonate, Beet Molasses, Dried Papaya, Dried Carrots, Navy Beans, Cane Molasses, Dicalcium Phosphate, Wheat Flour, Dried Whey, Choline Chloride, Salt, Brewers Dried Yeast, Mineral Oil, L-Ascorbyl-2-Polyphosphate, Vitamin E Supplement, Potassium Chloride, L-Lysine, Ferrous Sulfate, Kaolin, Magnesium Oxide, Calcium Propionate (a preservative), Color Added (Yellow #5, Blue #1, Yellow #6, Titanium Dioxide, Red #40, Red #3), Corn Distillers Dried Grains, Sodium Selenite, DL-Methionine, Niacin Supplement, Copper Sulfate, Menadione Sodium Bisulfite Complex, Zinc Oxide, Calcium Pantothenate, Manganous Oxide, Vitamin B12 Supplement, Thiamine Mononitrate, Manganese Sulfate, Rice Hulls, Biotin, Zinc Sulfate, Vitamin A Supplement, Riboflavin Supplement, Propionic Acid (a preservative), Folic Acid, Yucca Schidigera Extract, Mixed Tocopherols (a preservative), Cobalt Carbonate, Ethylenediamine Dihydriodide, Silicon Dioxide, Vitamin D3 Supplement, Pyridoxine Hydrochloride, Citric Acid (a preservative), Vegetable Oil, Rosemary Extract, Sodium Selenate, Calcium Iodate. Without seeing the ingredients for one I can't truly compare. But the Wild Harvest Hamster and Gerbil is a bit too high in crude protein for most pet shop mice at 15%. 12-14% is what's generally recommended. The Bonanza Hamster has better crude protein and the fat is ok too, though on the low end (recommended 5-7%). Fiber is a tiny bit high (recommended under 10%). I personally don't really like that the ingredients seem to be mostly corn. It has ok variety with 13 different whole ingredients. Many would recommend to pick out the stripes sunflower seeds, peanuts, and raisins (because of this, I didn't count these) but this of course would completely change the GA. I don't like the added coloring. I personally don't recommend any of the foods from walmart. You get what you pay for. But if it's all you can swing and these are the only two option, go with the Bonanza. Unless you find the ingredients in the other and they wow me - but that's unlikely. It's from Walmart, the protein is a little high but not out of the recommended range. Though it's bird food, from what I can see, it looks a lot better for the mice than the hamster food. There are a few things you'll need to pick out though and it might mess up the GA a bit, so I don't know.. But I'm not an expert on diet so I'd wait for someone else to elaborate on that. Parakeet mixes are often better. Can you share the ingredients and GA? Oh snap. This one actually loaded all the way for me. Ingredients look much better! 18 whole ingredients. EXCEPT: onion, leeks, and crushed red peppers (hot chili pepper) are not safe. Raisins and pineapple are questionable, so are also on the avoid list. And of course artificial coloring but that ones very hard to avoid in commercial foods. Thanks, since I have two birds I might mix their bird seed (which is Wild Harvest) into my homemade mouse mix. I'll also add more ingredients to my mix and continue to get my pellets for a balanced diet.